What jumps out at you? Any surprises? 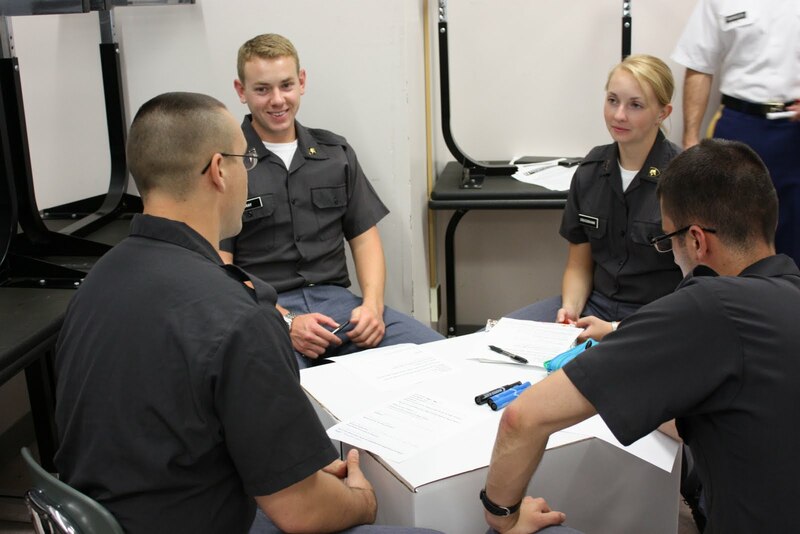 This week, we kicked off a 3-month course at West Point called MX400: Officership. 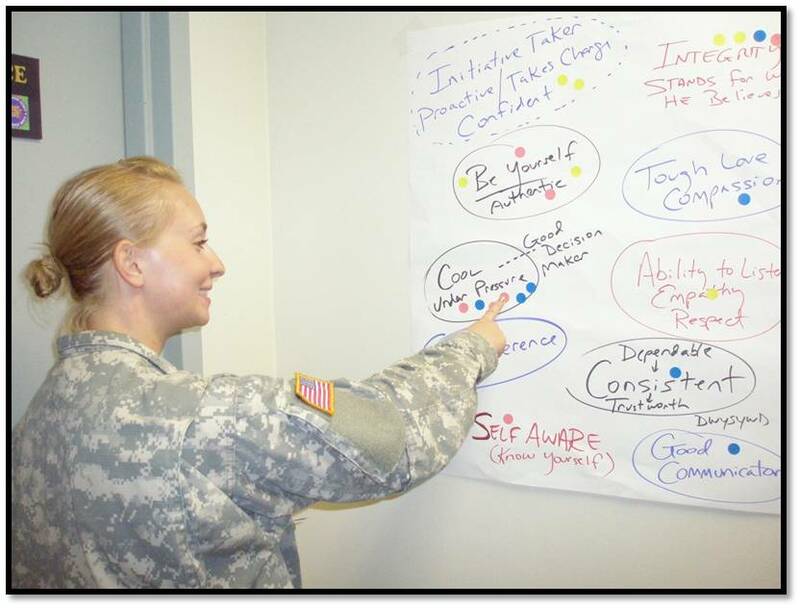 This is a capstone course for seniors that focuses on the character, competence, and leadership skills officers need to lead Soldiers in battle–to accomplish the mission at least cost–along with a range of topics that are important to officership. For our first class meeting, we ran a Leadership in Action (LIA!) workshop. This is the question we asked the cadets. They each answered the question by telling a one-minute story of leadership in action (LIA! )—giving each other concrete, personal examples of real-life leadership. After 3 rounds of storytelling in small groups, we finished the workshop by talking about the themes that emerged. The stories gave us a new glimpse into what is forging our understanding of what it means to lead. Read LIA! 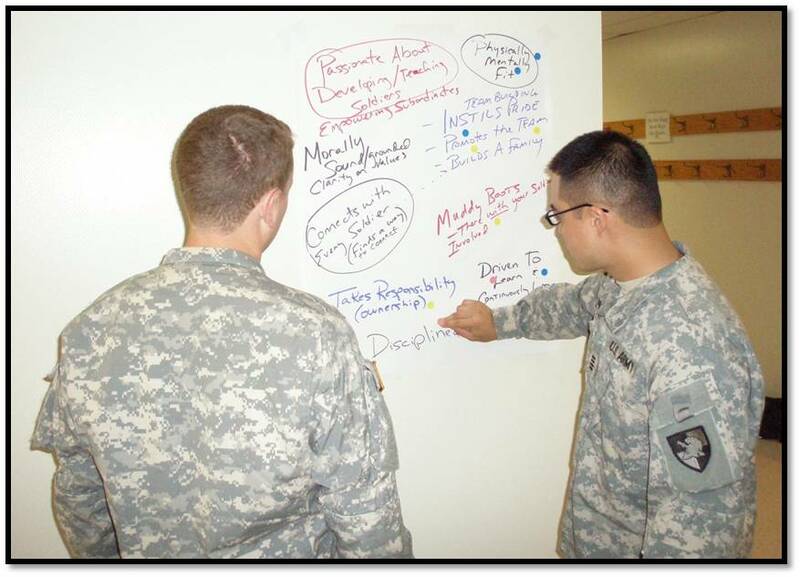 stories and learn about how to run a workshop in this ARMY Magazine article (PDF). If you are like us, reading this article will call to mind your own stories, and it will evoke in you a desire to lead in a way that is worthy of a story yet to be told. 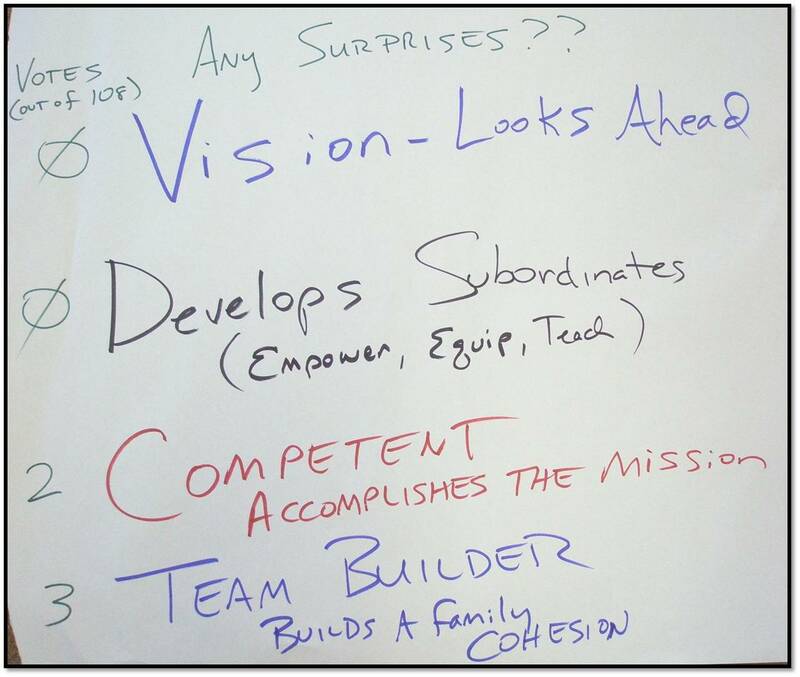 Also, see the April 5 blog post describing the Leadership in Action process in full. We have used this exercise to great benefit over the years. The basic concept is to get everyone thinking about the great teams they’ve been a part of and to channel that energy into growing the current team. It rests on the principle that we the team members can, together, create a great team; it is in our hands to envision greatness and to take action to move us there. It also ends up being a powerful way to get to know each other better and to understand some of our important past experiences. Ask your leaders to think about the best team they’ve ever been on, and to think about a story they could tell — a “postcard” or “snapshot” story that would give us a feel for the team. You can pair up people and have them tell their stories to each other or do the small group thing like the “Leadership in Action” Workshop. In a small group, it is nice for everyone to get to tell their story. Unpack the stories a bit and build the set of characteristics that were evident in the stories. Ask, “We just heard some phenomenal stories about great teams you’ve been part of. What do you think made these teams great? 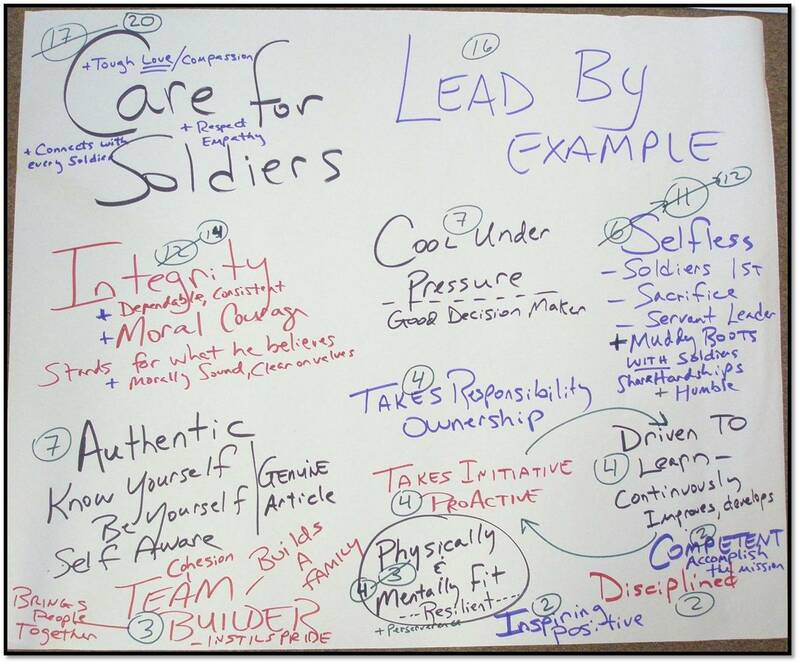 What are the defining characteristics of these great teams, characteristics that were evident in the stories?” Capture the brainstorm on a dry-erase board or on easel paper. Try to hone in on and use language that was used in the actual stories. The more specific and in keeping with the specific stories, the better. Vote on the characteristics of a great team that you want to define your team — the team we want to become. One effective way to do this is to organize the Part 2 brainstorm on one sheet of easel paper. Note: sometimes you can group several team characteristics together. I like to give each person three colored round stickers and do three rounds of voting. I take a photograph after each round of voting (1st round is when you place your first vote; 2nd round is when everyone places their 2nd vote, etc.). That way you can see things emerging. It is interesting to see where people vote first. The list of characteristics that get the most votes become your team’s aspiration — the team that you want to become, the description that you want to describe your team in the future. There’s no formula for this, so be adaptive. Somewhere around 5 characteristics can work well. Compare the envisioned future with current reality. As we look at the team that we want to become, how do we compare now? What do we need to do in order to move in that direction, to reach our vision? Drawing on an image that Peter Senge shared, I like giving each participant a larger ranger rubber band (black band) which they stretch between their hands. The top hand is the envisioned future and the bottom hand is current reality. As we hold out and gain a clear vision for what we want to become and, simultaneously, look in the mirror and are honest about current reality, it creates tension that helps us move toward that envisioned future. Most people don’t like tension. To reduce that tension, we will lower our standard (go for something less) or deceive ourselves about our current reality. Once we understand this dynamic, we can appreciate that tension as a positive. Leadership happens when team members begin behaving in the moment in ways that are consistent with the envisioned future, when they take action to move from current reality to envisioned future, and when they help maintain the positive tension that propels us to the future we want. I think you can do Part 1 and 2 in one session, while you need some amount of time before you dive into Part 3 (an hour to a day or two). I think you might want to give a day or even a week before you dive into Part 4. You can capture the description of the team in creative ways. Maybe on a t-shirt that everyone can wear or on a poster that everyone sees. The more personal it can be as far as the language used, the better. It needs to be grounded in the actual emotional stories that the team members told. That is where the power lies. Think of this more as a catalyst for conversation that generates energy, vision, and even accountability rather than a product that is created and then forgotten. Recently, a group of us spent the evening talking about leadership. The way we did it was this: we told one-minute “Leadership in Action” stories to each other (that is not a lot of time). Picture 25 leaders in small groups, 3-4 per table, each telling a story about an experience that impacted them and that stands out as an example of a leader leading. We kept a clock, keeping us to one-minute each. After we were done at that first table, we each rotated to a different table and the clock started again: we told our story to fresh faces and listened to several new stories. We did three rounds of this. By the time the “speed dating” was over, we had shared our story three times and had listened to at least 9 great stories. It was energizing and even inspiring. We came away from the experience fired up and plugged back into what we value most in a leader. ASIDE: This can work as an ice breaker for new groups or an energizing experience for those who have been together for a long time. In addition to the learning around the topic of leadership, there are two skills that participants get to practice in this workshop: 1. The art of storytelling; 2. The art of engaged listening. As a facilitator, it helps to mention this. We like to interrupt the workshop after round 1 to talk specifically about how to be an engaged listener. After round 3, we asked everyone to stand up and said: “Each of us is now going to put a hand on the shoulder of one person whose story really connected with us.” Picture the chaos. I have my hand on your shoulder, and you have to pull me across the room in order to get your hand on someone else’s shoulder. Big thanks to Nancy Dixon who shared this “shoulder touching” idea with us. Once everyone had their hand on one person’s shoulder, there were some participants who had many hands on them. We finished the workshop by asking these particular people to share their story one more time, this time with the entire group. A week later, we did this again with a group of 27 Army lieutenants. We didn’t have time to do the full-blown version, so we introduced the idea and paired everyone up. Two minutes later, every person in the room had shared their story and heard a story. We closed out by inviting people whose buddy had shared an especially good story to “nominate” him or her to tell the story to the entire group. After five people shared their story to the entire group, we talked briefly about observations or insights that had emerged for people and, bam, we were done. Ten minutes incredibly well spent!